Petunia had been living alone on the streets for months. She often visited a park where people sometimes fed her, but for the most part, she was on her own. 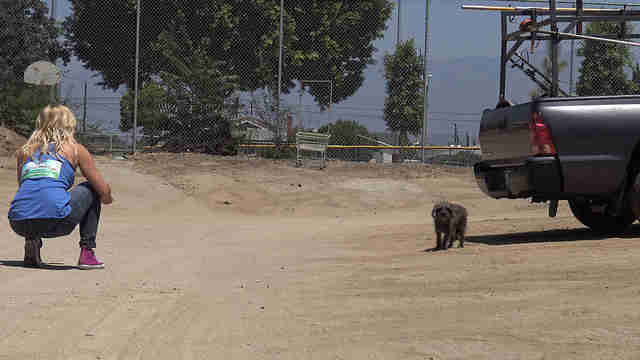 Hope for Paws, a rescue organization in Los Angeles, heard about Petunia and stepped up to help. 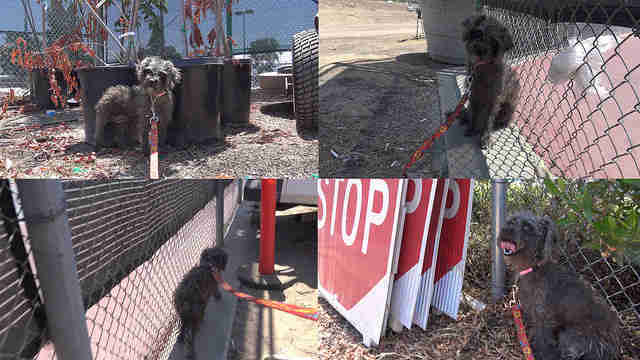 They drove to where she was usually seen and found her wandering around in a parking lot. 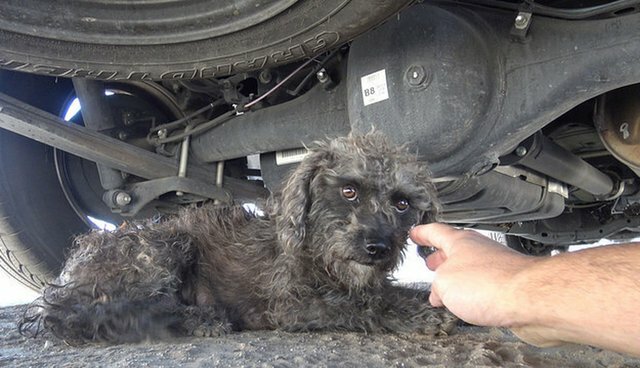 She was a little scared of her rescuers at first, and took shelter under a nearby truck. 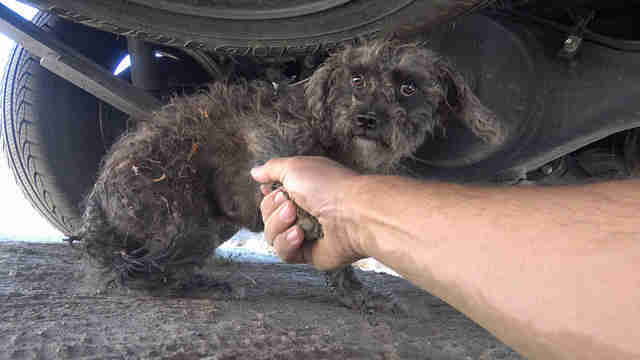 "I laid flat on my stomach and crawled under the truck," Eldad Hagar, founder of Hope for Paws, told The Dodo. "Petunia wagged her tail nervously, but I knew we would be cool. At one moment this closeness made her nervous, and she got up to leave. That's the moment when I grabbed her leg." 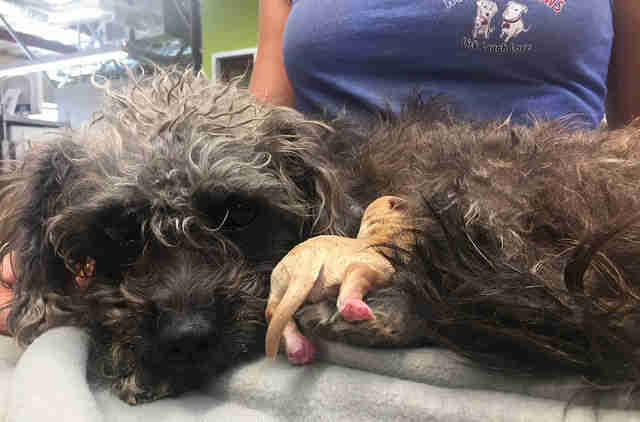 It's not typically a good idea to grab a scared dog so suddenly, but Hagar was worried Petunia might run away again, and he desperately wanted to rescue her. 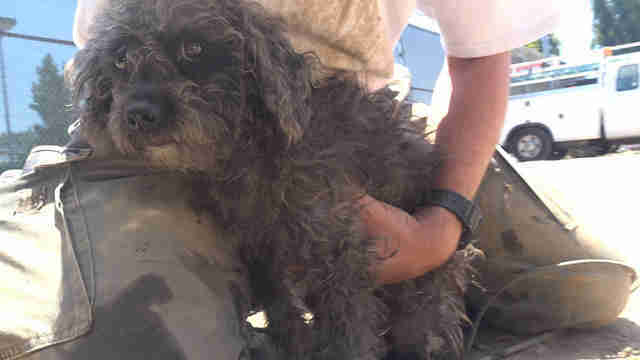 Luckily Hagar is very experienced and acted fast, and was able to quickly pull Petunia out from under the truck and into his lap. Even though she was still scared, Petunia also seemed to know that she was finally safe. "The way I always explain it to people who ask about me doing something a little more 'aggressive' (like grabbing a leg) is that having this stress for five seconds is worth the lifetime of happiness that is coming ahead of them," Hagar said. 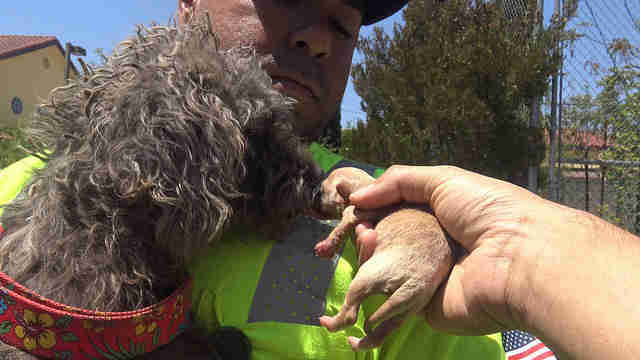 As soon as Petunia was safely in her rescuers' arms, they realized why she'd been so nervous - Petunia was lactating, and therefore had a puppy somewhere near by. 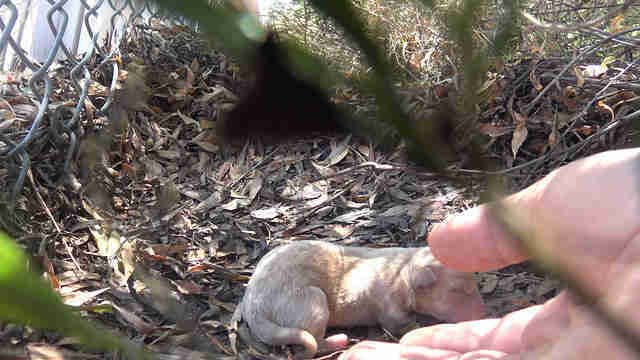 It didn't take long for rescuers to locate Petunia's baby, on a pile of leaves in some bushes. 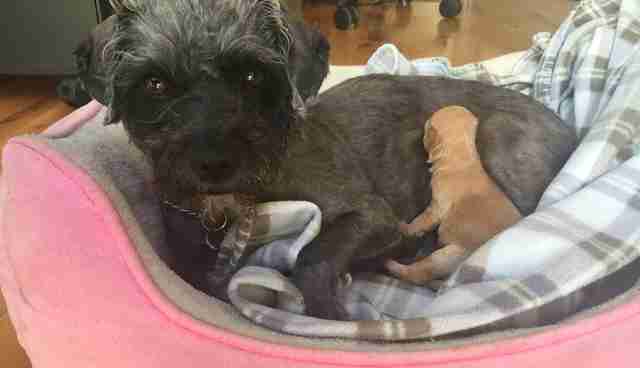 They named the 3-day-old puppy Petals, and immediately brought her back to her mom, which calmed some of Petunia's anxieties. Hagar was a little worried that Petunia might be hiding more puppies somewhere, and so he decided to see if Petunia would lead him to them. He brought Petunia to different spots in the area and played a video of puppies crying, which can make a mother dog's maternal instincts kick in. As soon as she heard the video, Petunia led Hagar back to Petals every time, making him confident that she was Petunia's only puppy. He and the other rescuers then quickly rushed the mother/daughter duo to the vet to get the care they needed. Besides a slight infection in her ear, Petunia was deemed completely healthy, and so was her puppy Petals. Both dogs are getting stronger and happier by the day, and will eventually be ready to find their forever homes far away from the streets where they were found. "Both Petunia and Petals are doing great," Hagar said. "Little Petals hasn't opened her eyes yet, but it should happen in the next few days. She is gaining weight and is quite happy to have her mom."